Seoul Tower is built on a 262 meter peak in Namsan Park. This tower is 480meter above sea level, one of the highest tower in the world and one of the most interesting tower especially at night with your love ones. 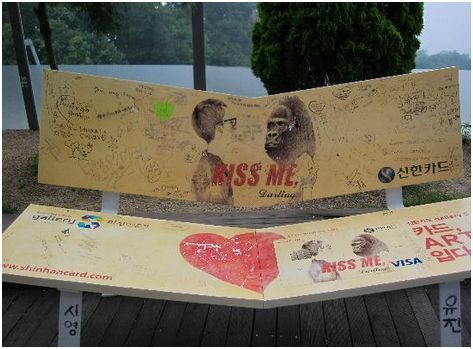 There are usually lots of couples who visit Seoul tower to enjoy a romantic night, to propose or just sitting on the love seat. The love seat is special as it is dipped in the middle and couple had no choice but to sit very close to each other. I find that very interesting as I have not seen anything like this before. It works very well for shy couples (I believe).There is a warm sitting lounge where couple can sit in the dark and watch the lights in the City of Seoul. You have to be there early to get a seat as it is very busy. There are approx only a dozen “double” seats only. Used the subway to get to Myeongdong station exit 3, walked towards Pacific Hotel. Follow the road on the right side of Pacific Hotel (if you are facing the hotel). This is the shortest route to use if you are getting off at Myeong-dong station (about 10 minutes). If you take the left road of pacific hotel, you will still get there but it is more hilly and further (about 15 minutes). 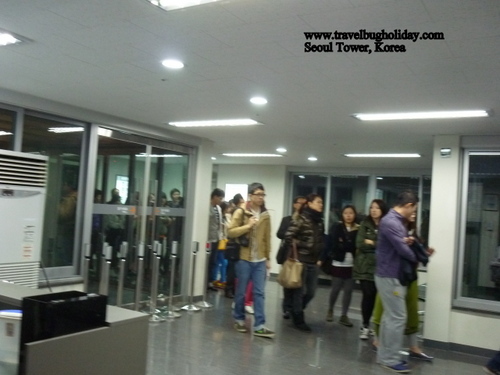 This is the route to use if you are taking the cable car to get to the bottom of Seoul Tower. 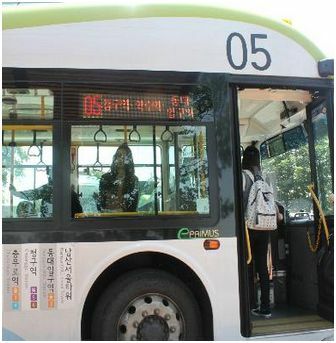 8,000won for return journey. Single journey is 6,000won. 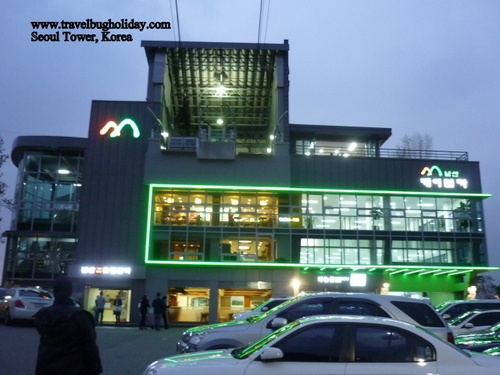 You can also take the subway to Hoehyeon exit 1 and walk to Sogong Ro (main road). In either route, you need to walk towards Namsun tunnel 3. There you will see the Namsan Ohreumi (inclined elevator).This will get you up the mountain to where you can take the cable car without walking up any steps. Once you get out of the elevator, you will see the cable station on your left. You can take a bus instead of the subway. The Seoul City Tour Buses takes you up here. 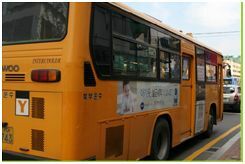 Or if you use the local bus, you need take the yellow Namsan Sunhwan Shuttle Bus no 2 or no 3 or no 5. The bus will circle the mountain, so you can take the same number bus down. One can also walked all the way up from the bus stop. Among three of them, I recommend cable car since you can take a lot of cool photos while sitting in the cable car and enjoy the night scene of Seoul city. 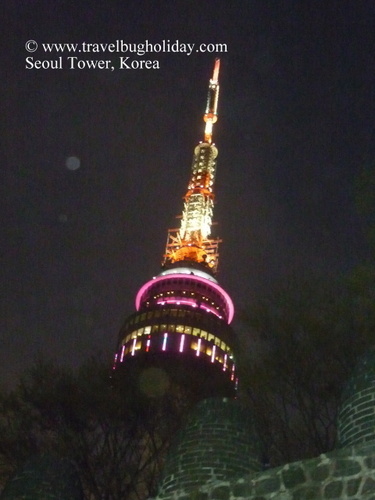 There are usually a lot of couples who visit Seoul Tower during night time to enjoy a romantic and peaceful night. 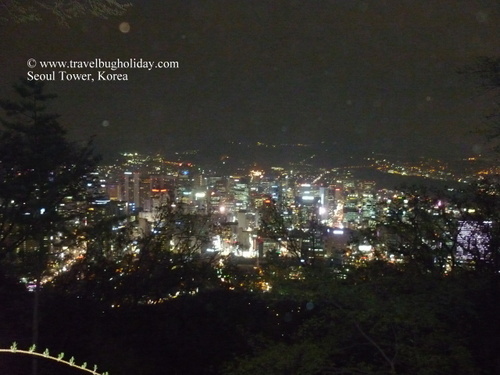 In order to avoid the crowd of people, you can visit at daytime but night view at the Seoul Tower is the best. The best time to visit Seoul tower is before sunset. This is so that you can see the spectacular flowering g trees as you ascend the mountain up Seoul tower, expecially in mid April - end of April. Stay up there for dinner and there are package deals for dinner and entrance fees to observatory tower, teddy bear museum etc. I had dinner (without package at a Korean noodle restaurant. 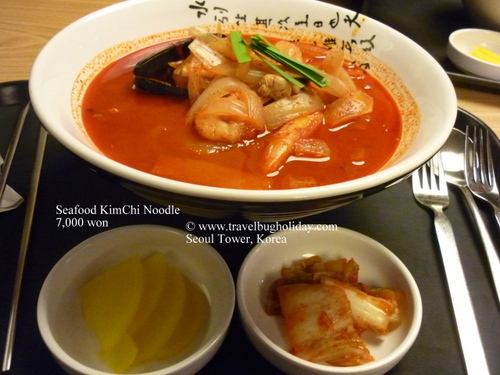 I had kimchi seafood noodle. Cost me 7,500 won. If you just want to go to observatory without taking up the dinner and entrance fees package, it cost 8000 won. 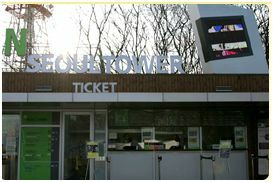 At the top of tower, there is a Digital Observatory, a high-powered telescope which provides you a 360° of view of Seoul by just putting 500won one time. 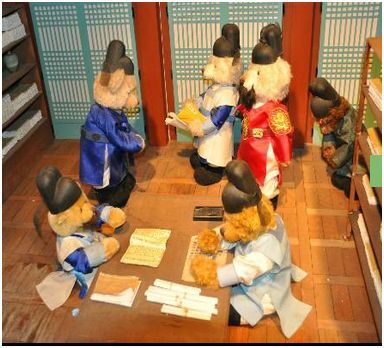 Besides, you can take a glance of mesmerizing Seoul city by looking out through the windows. 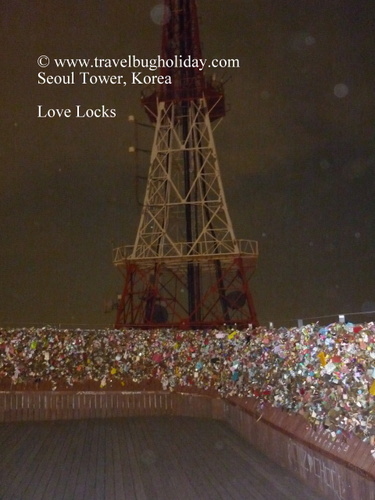 Tips:Tips: Get to Seoul tower before nightfall. That way if you use the cable car up, you can see the lovely flowering trees. Even if you take the bus, you can see them along the roadsides. However at night, everything is pitch black except for the city lights. Also good to know that Myeongdong, Namsan tower and Namdaemun - These three places are in the same location. You can do within one day. 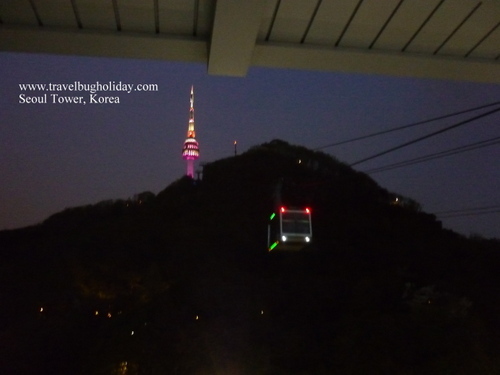 From Myeongdong subway station, you could walk around 15 minutes up the hill to Namsan tower cable station. Myeongdong is a great place to shop for younger generation and I like the energy there. If you want to watch Nanta show you could opt for Myeongdong theater. Namdaemun is just across the road after you complete the whole stretch of Myeongdong street and a few shopping complex are around the are - Shinsegae, Lotte and Avenue. I love eating at the basement food court in Lotte but most of the time it's crowded. Yes, I love Korea! So many interesting sights and nice people. Pity I can’t speak the language. This is a really well written article – thanks!! !